Ultra adjustable anti-microbial ergonomic vinyl chair allows personalized positioning for day-long comfort and improved productivity. Extra thick 3-1/2 padding features anti-microbial vinyl upholstery that protects against mold and bacteria growth. Waterfall contoured design helps reduce stress on your knees and improve leg circulation. Contoured back provides lumbar support. Extra large 20"W x 19-1/2"D seat and 19-1/2"W x 20"H back. Polished aluminum base with 2" dual wheel carpet casters provide easy mobility. 15 1/2"-19 1/2" pneumatic height adjustment. Easy assembly. 1 Year Limited Warranty. Also available, optional stool glides can replace casters for stationary use. 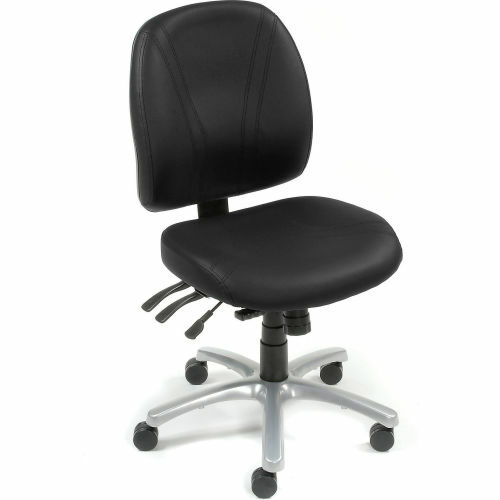 Congratulations, you have found descriptions, reviews, prices, and availability for Antibacterial Office Chair Vinyl Black. Our crawler software prepared this page for you while searching for "zz" and related Office Supplies products at Global Industrial. If you have any questions on this product, please give us a call at 734-971-1210 during the hours of 9am - 5pm EST for assistance. Thank you for shopping at Tbook.com, the Internet Department Store!